A couple of years back, we took a family vacation up to Victoria, BC and I was lucky enough to meet up with a fellow blogger at the gorgeous Munro Books. I didn't buy many books there though because they cost so much more in Canada than in the US (even though the currencies are almost equivalent right now). 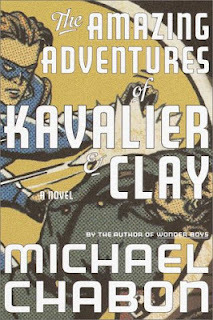 But, they had this UK version of Michael Chabon's The Amazing Adventures of Kavalier & Clay on the remainder table and I liked the cover more than the standard paperback in the US and so I grabbed it. It's a book I knew I should read but it took me until now to want to read it. Now I fully regret waiting so long because it's a masterpiece and is not just for comic book fans (though there are fun tidbits in it for those fans). 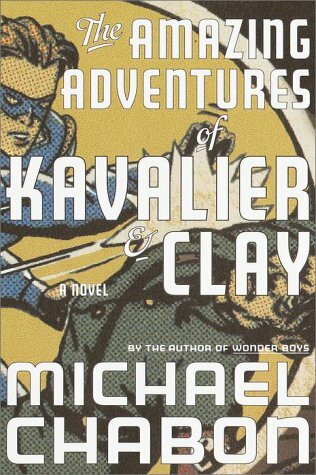 This is the story of Sam Clay (Samuel Klayman) and his Hungarian cousin, Joe Kavalier (Josef). Following them from childhood through middle age, these cousins who become close friends and brothers, are the creators of the superhero The Escapist. But Joe is never free from the feelings of obligation toward the family he left behind in Prague at the start of WWII and Sam is never free from the weight of his absentee strongman father. This is simply an incredibly well-crafted novel. Though its subjects and locales are diverse, I think there will be some aspect to speak to almost any reader. I never felt that I couldn't relate to these boys whose lives were so incredibly remote from my own. 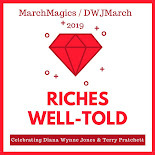 In fact, I felt that I learned a lot about the Jewish experience in New York during the War and about the history of comic books and about magic and art and so many other things. 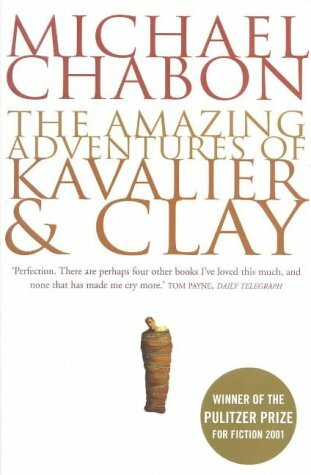 The blurb on the front of my copy from Tom Payne (Daily Telegraph) says "Perfection. There are perhaps four other books I've loved this much, and none that has made me cry more." I was feeling a bit cheated because I didn't cry while reading the book and I'm quite well-known for getting emotionally involved in stories. But then, on page 633 of 636, there was one single line of dialogue that had me weeping because it revealed one of the inevitabilities of parenthood, one that I think about sometimes with sadness. This connection is one I hope to find again the next time I read Chabon. I have had this book on my shelf for a while. Maybe I need to move it up a bit?!? It is pretty amazing. I was certain I wouldn't like it but I did. He's an amazing author! Jenners - Same here and yet I loved it. Can't wait to read more by him! Aarti - I hope you pick it you soon because it's definitely a gem.